FREDERICK Opare–Ansah, Member of Parliament (MP) for Suhum in the Eastern Region, has made a donation worth GH¢240,000 to some communities aimed at developing the constituency. 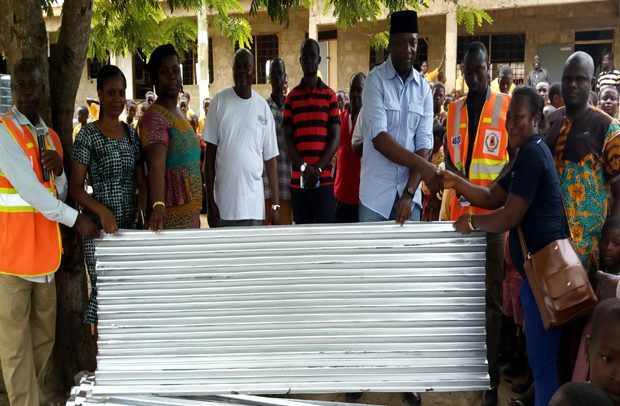 The items were over 300 street light bulbs, 500 pieces of roofing sheets and 20 bags of cement to support the Obuotumpan MA Basic School, whose roofs were ripped off recently during a heavy rainstorm. As part of the constituency tour, the MP used the opportunity to ‘school’ the residents on government’s key policies such as the Double Track Free SHS system, One District, One Factory, NEIP, YEA, afforestation projects, NHIS, among other key policies. He urged them to exercise restraint as the electricity situation was being managed. “There is not going to be ‘dumsor’ as it happened a few years ago,” he assured them. Mr. Opare-Ansah said the Akufo-Addo government is following pragmatic steps to ensure Ghanaians live better, stressing that the NPP government has good plans for the people. He also talked about drones to lift essential medicines to remote areas, saying it is a novelty that should be embraced by all since it would help to save lives. “I am aware that very soon the national security will come out with the regulations on the drone operations . . . We know there will be a bit of challenges that would confront the initiative but in all, I think it would benefit Ghanaians”.